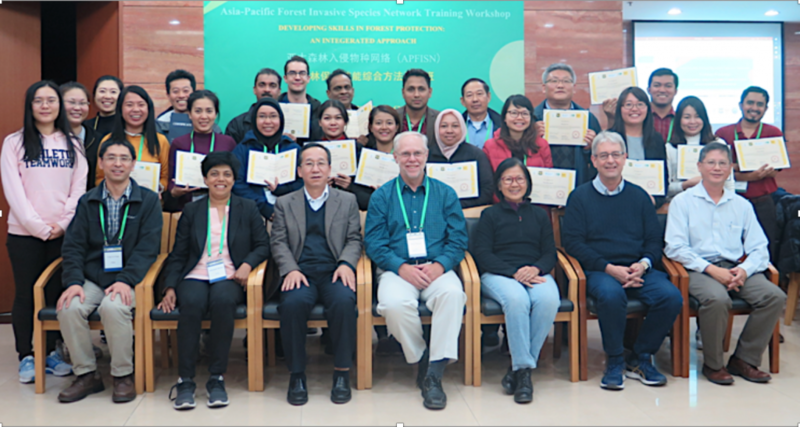 The Asia-Pacific Forest Invasive Species Network (APFISN), together with its supporters and partners organized a “Training Workshop: Developing Skills In Forest Protection - An Integrated Approach,” from 23–27 October 2018 in Beijing, China. 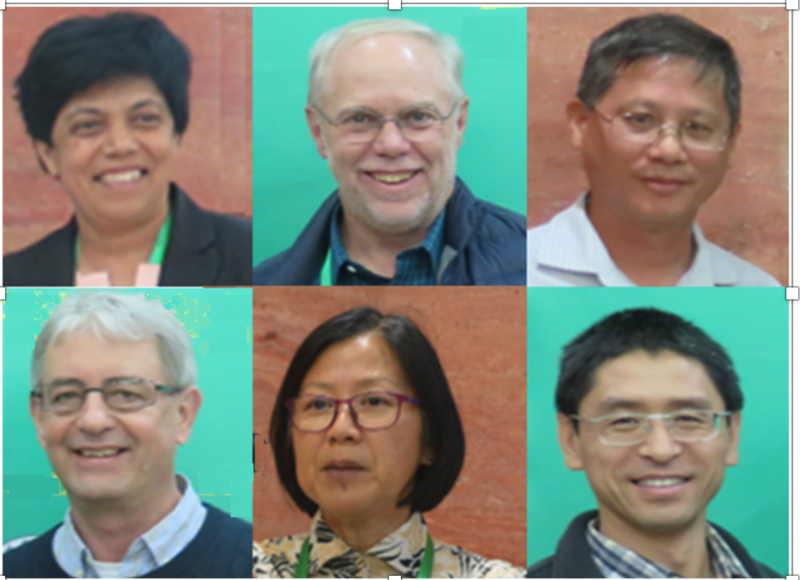 The organizers and hosts of the training workshop were: Asia Pacific Forest Invasive Species Network (APFISN); International Society of Zoological Sciences (ISZS); Institute of Zoology (IOZ), Chinese Academy of Sciences (CAS), College of Forestry, Beijing Forestry University, China; Sino-France Joint Laboratory for Invasive Forest Pests in EurAsia; Department of Afforestation and Greening, State Forestry and Grassland Administration (SFGA), China; Forest Service, USDA; FAO Regional Office for Asia and the Pacific. 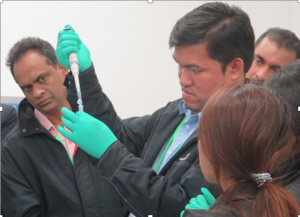 The major objectives of this training workshop were to equip participants with the skills to: 1) Understand the concept of the Disease Triangle, Koch’s Postulates, and what constitutes disease; 2) Recognize and identify the main causes of plant disease, basic biology, disease distribution and spread an to identify common fungi based on morphology and DNA bar-coding; 3) Detect and diagnose disease using various methods of sampling, culturing, specimen preservation and collection; and 4) Determine suitable methods of disease management and control with emphasis on integrated pest management (IPM). 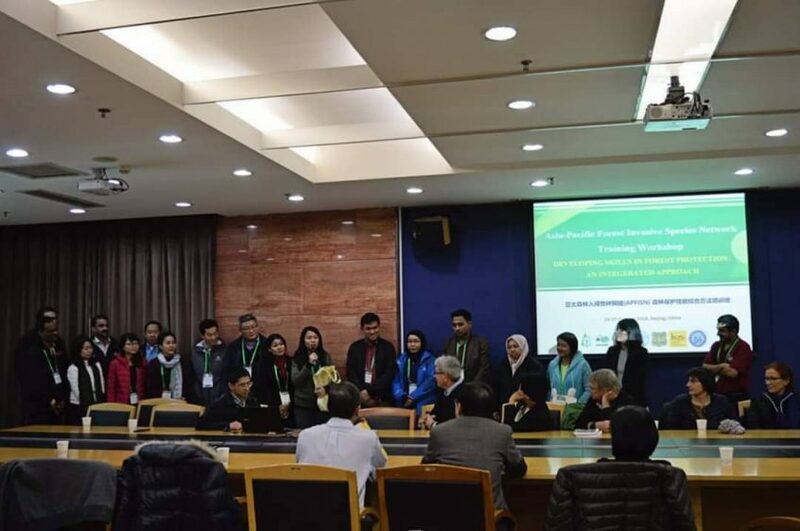 Nearly 50 participants from Vietnam, Laos, Cambodia, Thailand, Myanmar, Malaysia, Indonesia, India, Sri Lanka, Pakistan, Nepal, Japan, South Korea, DPRK, New Zealand, Australia, China and USA attended the workshop. 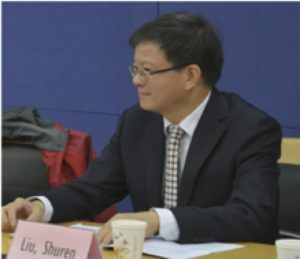 Shuren Liu, Deputy Director of Department of Afforestation and Greening, SFGA, China; Shiroma Sathyapala, Forest Officer at FAO Headquarters in Rome; Gary Man, an officer from Forest Service, USDA; Youqing Luo, Vice President, Beijing Forestry University, China delivered remarks at the opening, which was chaired by Jianghua Sun, head of the Asia Pacific Forest Invasive Species Network (APFISN) Beijing Office. 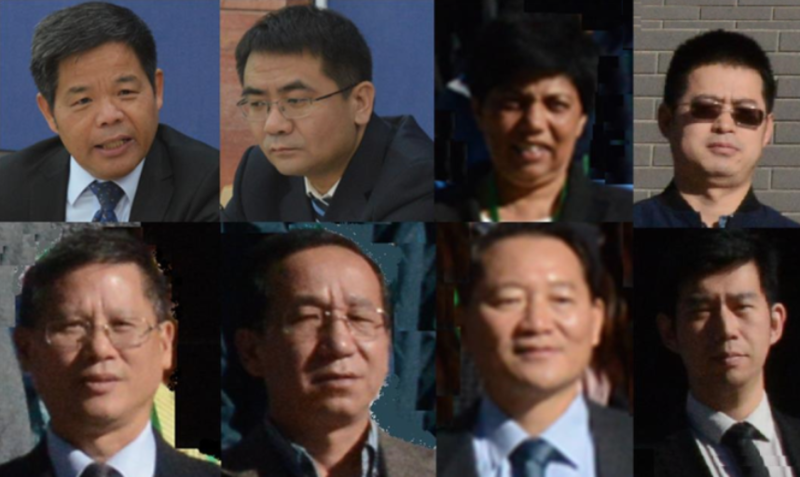 Yuxiang Zhao, Director, Division of Pest Control, SFGA; Chunxu Han, Secretary General, ISZS; Kenichi Shono, FAO Regional Office for Asia and the Pacific; Shixiang Zong, Deputy Dean, College of Forestry and Yu Lin, Deputy Director, Division of International Cooperation, Beijing Forestry University, China were present at the opening. Dr Bruce Moltzan from USDA delivered lectures on Historical Perspectives, Biotic & Abiotic Diseases; Forest Pathology Concepts, Disease Triangle; Disease Cycles & Epidemiology; Branch and Stem Diseases; Integrated Pest Management; Survey & Monitoring: Establishing Plots; Data Capture; and Effective Reporting. Dr SuSee Lee from Malaysia lectured on Overview of major pathogens in the region; Nutritional Strategies; Root Diseases; and Principles of Disease Control & Management. Dr Yonglin Wang from Beijing Forestry University presented lectures on Signs/Symptoms: Fungi, Bacteria, Nematodes, Virus, Phytoplasmas; How to isolate from diseased plant samples and make cultures; Foliar Diseases; Molecular diagnostics in plant pathology (DNA barcoding, PCR amplification) and how to isolate fungal DNA and perform PCR amplification (bench work). Furthermore, Dr Simon Lawson from Australia gave an oral presentation on Insect-vectored diseases and Dr Shiroma Sathyapala from FAO presented on Phytosanitary Standards & Quarantine. Gary Man organized an opening discussion on Networks to find answers using resources/links. 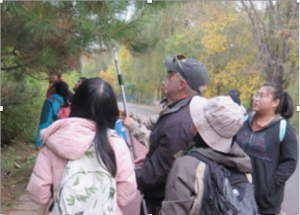 The workshop organized a field trip in Beijing to collect samples and to test the survey methods learned in class. In laboratory, the participants processed the samples collected and checked the fungal cultures prepared by themselves under microscopes. 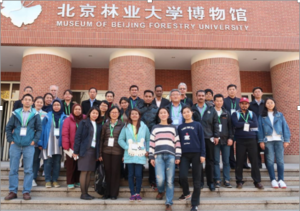 The participants also visited the campus, Beijing Forestry Museum and Beijing Key Laboratory for Forest Pest Control at the University. At the end the workshop, diplomas were presented to participants. It was widely acknowledged that this training workshop was a great success. The participants not only exchanged information, but learned new knowledge and explored opportunities for cooperation or collaboration. 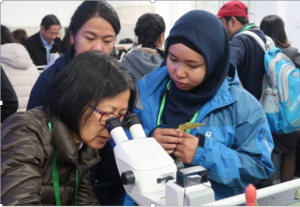 It was also widely expected that more studies on invasive species monitoring, identification and control; specific research and control method for specific species should be organized through the network. Also more financial support should be placed on strengthening the network and capacity build-up for both short-term and long-term invasive species management.